Testimonial Houston Granite and Flooring L.L.C. Testimonial - Houston Granite and Flooring L.L.C. "I love my new countertops"
I would like to personally thank you, your staff and contracting team, for a job well done. It was a pleasure dealing with the professional that represents your company. Your materials were as described over the phone and your web site made it easy to make the selection of a high quality granite counter top. 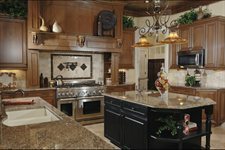 I will recommend all my clients and friends to Houston Granite and Flooring.